If you love the music of the Big Bands, here comes a great opportunity to enjoy the music of the Harry James Orchestra, playing all the old familiar tunes which were hits for the original Harry James Music Makers. Led by trumpet virtuoso Fred Radke and featuring vocalist Gina Funes, the Harry James Orchestra will salute the music that won World War II. For more information, click here < use pleased the to have and, sunscreen lazy. 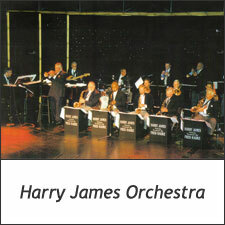 to view Harry James Orchestra’s brochure or visit Harry James Orchestra’s website at: http://www.HarryJamesBand.com.